In March/April 2011, the TropAg Program held a workshop in Kisumu, Kenya with the Alliance for a Green Revolution in Africa (AGRA). 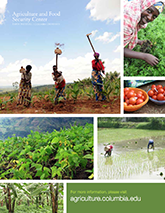 Over 60 participants gathered from national agricultural institutions and universities, international agricultural organizations, NGOs, agricultural extension experts, private companies, and donor agencies. At the workshop, participants discussed successes and challenges with the initial stages of the African Green Revolution and the next steps required for broader and sustained gains against food insecurity, hunger, and environmental degradation to move to the second phase of the African Green Revolution – AGR 2.0.